Swallowing or eating dirt is common in children. It is estimated that 1 in 5 children eat or swallow dirt (soil or mud) occasionally. What are the Causes of Swallowing Dirt? What are the Signs and Symptoms of Swallowing Dirt? How is First Aid administered for Swallowing Dirt? Generally, Swallowing Dirt is a non-serious condition. With appropriate and adequate home care, the child can recover completely, without any severe symptoms being noted. 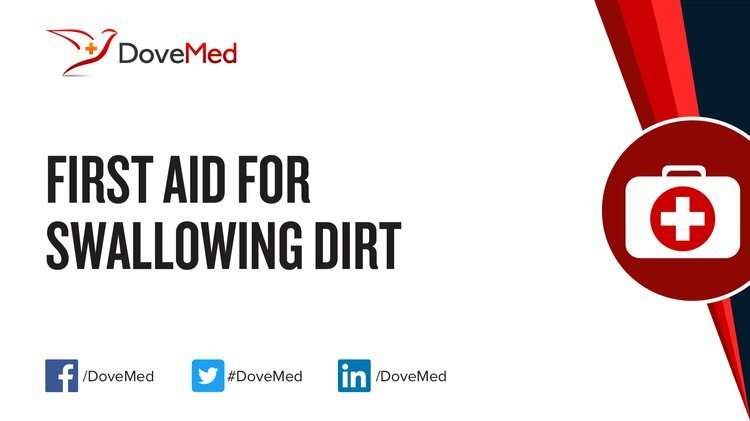 Who should administer First Aid for Swallowing Dirt? Someone near the affected individual (a caretaker or parent of the child) should administer initial first aid, following which one should seek medical help. What is the Prognosis of Swallowing Dirt? How can Swallowing Dirt be Prevented? Kit, E. L. I. S. A. AccuDiag™ Toxocara IgG. SANDFORD, B. (2013). THE patient about whom I am writing, and whom I will call. New Directions in Psycho-Analysis: The Significance of Infant Conflict in the Pattern of Adult Behaviour, 7, 266. Axe, J. (2016). Eat Dirt: Why Leaky Gut May be the Root Cause of Your Health Problems and 5 Surprising Steps to Cure it. Pan Macmillan. Shetreat-Klein, M. (2016). The Dirt Cure: Growing Healthy Kids with Food Straight from Soil. Simon and Schuster. Gilbert, J., & Knight, R. (2017). Dirt is Good: The Advantage of Germs for Your Child's Developing Immune System. St. Martin's Press. Van De, N., Trung, N. V., & Le Van Duyet, J. Y. C. (2013). Molecular diagnosis of an ocular toxocariasis patient in Vietnam. The Korean journal of parasitology, 51(5), 563. Matson, J. L., Belva, B., Hattier, M. A., & Matson, M. L. (2011). Pica in persons with developmental disabilities: Characteristics, diagnosis, and assessment. Research in Autism Spectrum Disorders, 5(4), 1459-1464. NORTHEAST, W. (2010). Prepared by the Washington State Department of Health.